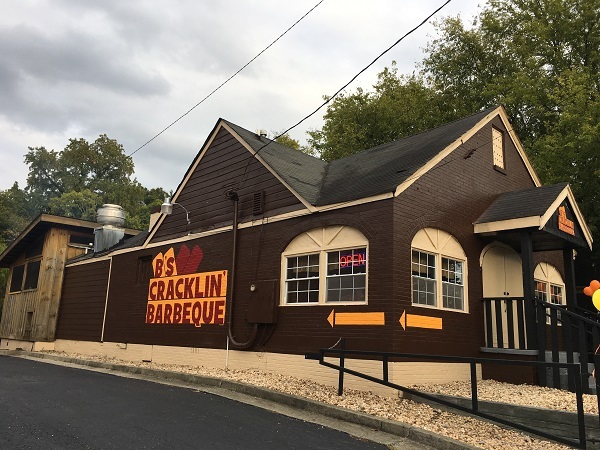 B’s Cracklin’ Barbecue, Atlanta GA – Marie, Let's Eat! There were several instances where I questioned whether I really wanted to move to Tennessee. 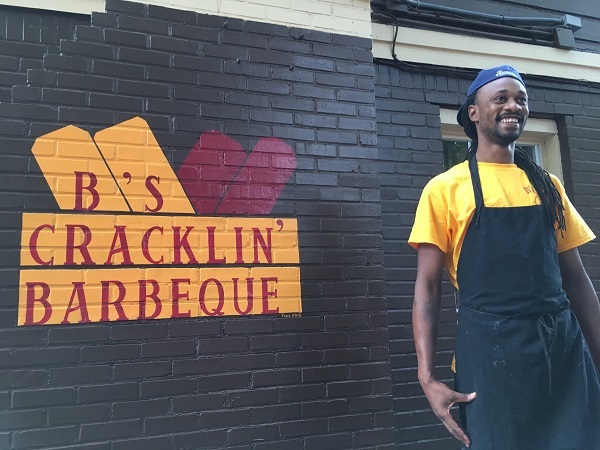 One was when I heard the advance buzz that Bryan Furman would be opening a second location of his popular Savannah barbecue restaurant about twenty minutes from our old house. We made good time heading west down I-20 after our two barbecue stops and rewarded the boychild for his superhuman patience the day before. The original plan for our trip to Atlanta was to spend a few hours playing with our son at my former employer, the Children’s Museum of Atlanta. Then Marie decided she’d much rather drop us off and go shop at Buford Highway Farmer’s Market. I was catching up with a co-worker and explained why Marie wasn’t with us. “Can’t say that I blame her,” she said. Well, Marie missed out, but we got a couple of hours of great playing in, and I chatted with three old buddies for a minute. Then we met her on the street and I drove to B’s Cracklin’ Barbecue over on the west side. Considering his real estate options, Furman, sensibly, looked around for a restaurant that was previously home to a barbecue place. This had been the home of Hottie Hawg’s, which we’d visited once or twice, but which shut down at the beginning of this year. It’s a great building in a pretty good location, perfect for kicking back on their deck on a mild autumn day. Our friend Marilyn from Atlanta etc. joined us. We ordered at the counter and only had a couple of minutes of catching up before the servers brought out some really delicious food. 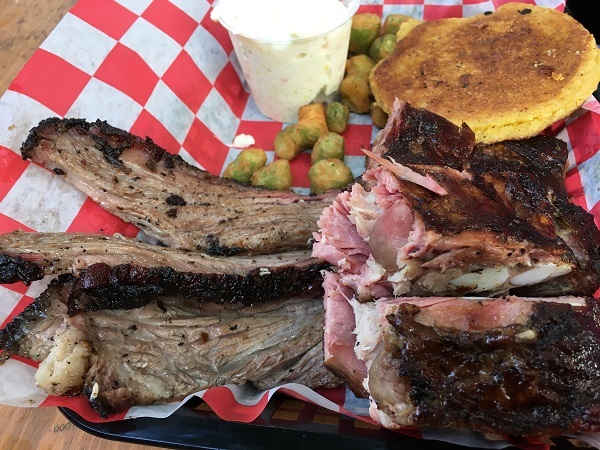 This is really, really good pork, with brisket and ribs also way above average. Furman buys heritage hogs and smokes the whole pig, which puts him in a very rare category in Georgia, where just about everybody uses shoulders or, occasionally, hams. He uses oak and cherry wood and the result is really tasty. Plus, he has hash and rice! Nobody else in Atlanta has this, except maybe occasionally as a special here and there once in a while at some of the “cheffy” places. It’s so good. In fact, I preferred B’s to any of the hash and rice I’d had over the last two days. It’s a different sort of barbecue trip when I only have stew at two restaurants, and enjoy somebody’s hash better than stew. 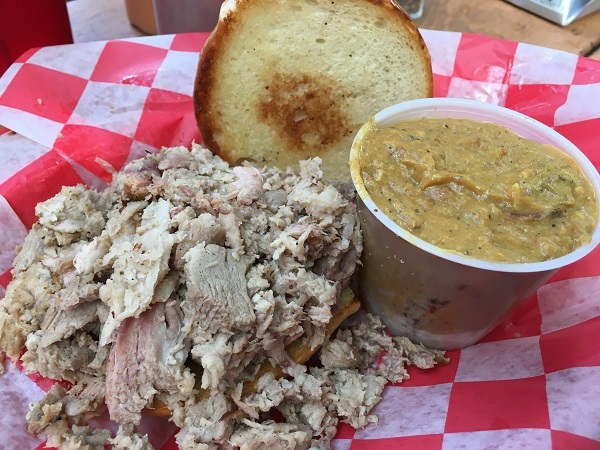 A couple of bites of the brisket that Marilyn ordered went really well with the mildly spicy vinegar sauce, but I liked the – get this – peach mustard sauce better on the pork. Dadblast it, why did we move to Tennessee when this place is so darn superior to anyplace in Chattanooga? By chance, we happened to schedule our visit in time with the grand opening party on October 15. The restaurant opened quietly about a month before to work out the kinks and I’m not aware of any remaining. There were balloons and our son got his face painted, and we got to speak with Bryan for a few minutes and wish him big success. We hugged goodbyes with Marilyn, drove up to the Kroger in our old neighborhood to pick up some cans of Skyline Chili (something else we can’t get in Chattanooga), and made it home around seven, pretty tired after our three day trip. The second day was a real trial, albeit one with some great meals, but the trip started and ended really well. Hopefully finances – I fear they’re very low at the moment – will let us go exploring on a big road trip again soon. Posted on December 9, 2016 by Grant G.Posted in atlanta, barbecue, georgiaTagged atlanta, barbecue, children's museums, georgia, hash and rice, mustard sauce. Looks pretty good.I’d love to try out that peach mustard sauce sounds weird but good at the same time. Is Savannah closer to you than Atlanta? Whichever, yes, I agree you should definitely come to one of Bryan’s restaurants soon! The sauce is delicious. Not anytime soon, but maybe in the spring! I’m glad you enjoyed this place though.